Slow Growth In Consumer Spending, Cities Concerned? Research shows that consumers’ everyday spending on most goods and services in 15 major U.S. metropolitan areas has slowed dramatically, from 5% in the second quarter of 2014 to 0.5% in the comparable period in 2015. The JP Morgan Chase Institute conducted a study to gain insight as to why consumers’ everyday spending on most goods and services has slowed dramatically. The study was done by collecting data from 12.4 billion credit and debit card transactions among 48 million JP Morgan Chase customers over a 34 month period within 15 metropolitan areas. By analyzing transaction characteristics between consumers and businesses at the point of sale, the Institute reveals trends at the neighborhood, city, and metropolitan levels as to how day-to-day, short term spending decisions are affecting urban economies. Shortly after the 2009 recession, real spending grew at a level consistent with prior non-recessionary periods dating to 1993. This suggests that post-recession recovery at the consumer level has been consistent with recent historical data. However, the rate of growth has started to slow, and retail spending is growing less robustly in real terms than it has over the past 20 years. 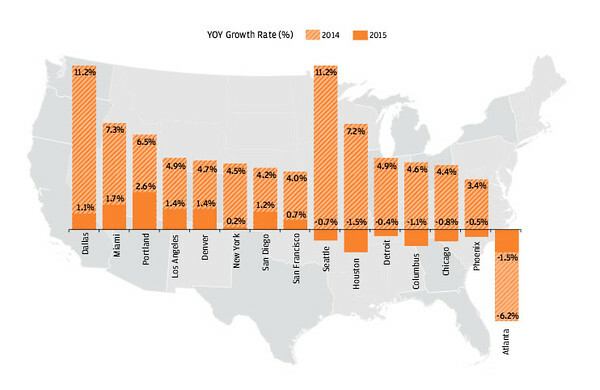 Overall, there has been an across-the-board 4.5% slowdown in the growth of local consumer commerce in the past year. Local consumer commercial growth among the 15 cities studied ranged from -1.5 percent to 2.6 percent between Q2 2014 and Q2 2015. In contrast, spending growth rates rose in most of the cities between Q2 2013 and Q2 2014, with a range of 2.7 percent to 11.2 percent.